I have been using this software for a while now but his new upgrade made it really useful.The “monkey machine” has been updated and is now the perfect online drum machine for music educators. The interface is simple and perfect for teaching music notation and drum rhythms. The timeline is divided up into squares, each representing a sixteenth note subdivision and of course there are sixteen of them to create a visual bar of 4/4 common time. This visual breakdown and subdivision is extremely useful when students are trying to figure out note values because they can visually see that there are four sixteenth notes in one quarter note etc. 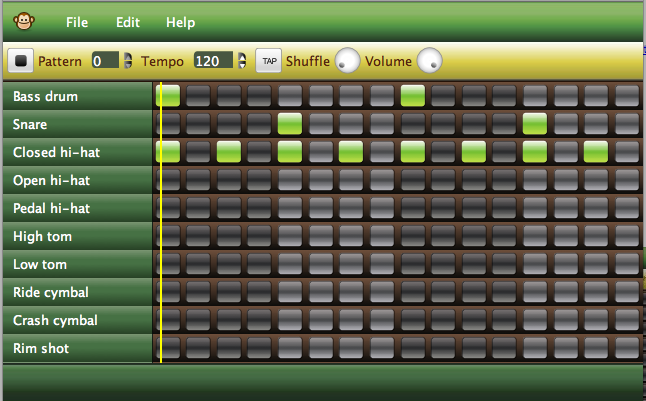 This makes it extremely easy for inputting rock drum beats for a song. Just printout or post the drum figures you want students to input and let them program the machine to play them. A good place to get beats is out of a drum method book or from the set part of the jazz band arrangements. This is a great process to teach not only how to create drum patterns and how rhythms fit together but you could also go further and give rhythm dictation and have them input what is being performed. The student can then listen to it and write in down using music notation, thus connecting the audio and visual examples together. Another way a drum machine like this can be used is to illustrate how a drummer builds on a beat or rhythm throughout a song and how things change a little in the chorus and verse. You can also program drum fills or drum solos. The Monkey Machine also lets you chose between two dynamic ranges for each individual note value. This is a good way to illustrate how dynamics can make a performance sound more natural and give the music a pulse. It is what a drummer does when they play. The BEST thing about Monkey Machine is that you can SAVE AND EXPORT AS A MIDI FILE. This is an element many drum machine do not include. What this enables the student to do is program a drum beat with dynamics and form the patterns before exporting the performance into a DAW software like GarageBand, Protools, or Sebelius. Check it out online at Monkey Machine. I just finished recording several vocalists at our school for a CD project. I am amazed at some of the young talent. However, a couple were having a difficult time keeping their young voice in tune. I didn’t want to use a digital pitch correction plugin to correct pitch because I wanted it to document “their” performance. But I still wanted to get them more in tune. Quite a dilemma. 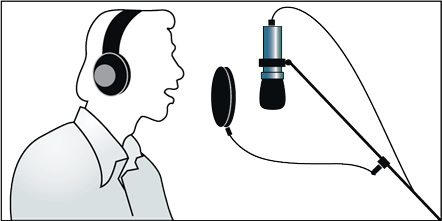 Here is what I did, it is simple and can cure most pitch problems and still gives you an unaltered recording of the student’s voice. Record a ghost track of the part that the vocalist will be singing with an instrument of choice. A ghost track is one that will be taken out later but helps the performance while recording. I used a digital piano as that was the instrument the student was used to hearing in practice. I used the digital version instead of an acoustic as it was fast to input and I was sure it was going to be perfectly in tune. Then I pumped it through the monitor headphones so she could sing along with it. After a successful take I went back and deleted the ghost track from the recording and the vocals were much better without manipulation of their performance. Great example for students. Most students tend to add too many different ideas at the same time or switch ideas too quickly. Here is a great video of how a song is built using repetition and melody. 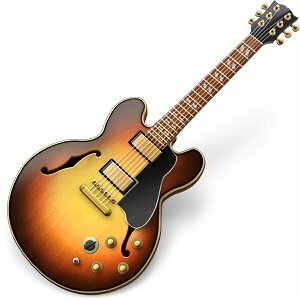 How to Auto-Tune yourself in GarageBand Here is a great project to help students learning how to compose lyrics for songs. For most of us, our vocal skills are somewhat limited. So to inspire students to write and record lyrics for their melodies teach them how to use auto tune. This is especially fun for students that do not have the greatest set of tonsils. They can sound very cool and record their original lyrics without sounding out of tune. AND, it is sooo much fun. Even though Auto-tune – that funky robot effect that ruled the radio for a big chunk of 2008 – has been officially declared dead by no less a rap superstar than Jay-Z himself, people still went nuts for T-Pain’s Auto-tune app on the iPhone. You don’t have to have an iPhone (or pay hundreds of dollars for official Antares Auto-tune software) to get that T-Pain sound, though. In fact, you can do it with an app that comes preloaded on the average Mac: Garageband. Check out the gallery for a step-by-step guide to bringing the T-Pain. MUSIC ACCORDING TO GARAGEBAND If you are one of the many users of Apple’s iLife GarageBand or if you have been waiting for the right opportunity to open it for the first time, this article may be of interest. INCLUDES A SET OF BEGINNER TUTORIALS FOR GARAGEBAND. Apple’s Garage Band is a great way to get into music, whether it’s learning a musical instrument or starting to produce your own music. It’s part of the iLife suite, which is inexpensive at $79, and also includes iPhoto, iMovie, iDVD and iWeb. It includes music lessons and a reasonable DAW complete with plug-ins, loops and instruments. I’ve just started teaching my 15-year-old daughter to play piano using the lessons in Garage Band, and so far I’m very impressed. The first lesson teaches a basic chord progression, and having to play the chords along with the computer teaches good timing. So far it’s a winner. Coming from Apple, this program only works on Mac OSX. There isn’t really an equivalent for Microsoft Windows, but Sony Sound Forge or Acoustica Mixcraft are worth looking at. Brad Johnston is a music teacher at Yokohama International School and has a every growing library of lesson plans and useful music resources. Everything from music history, tech tips, recording software, rubrics, you name it. If you find this blog interesting check out his school site at YISMusic.net It is used for the sole purpose of his YIS music classes in music technology and IB Music. However, check it out and if you find something useful let him know. Other sites of Brad’s and ways to connect with him are listed below. If you like GarageBand or a similar audio software for music composition and/or editing, and do not have it or a similar software available, try this new Web 2.0 software created by Avery. It is called “Myna”. I was just giving it a test run and it seems far better than I would expect for an online software. Far superior to the popular download free software Audacity, and you don’t have to install it on your computer. Myna has many more sophisticated features that are found in upper end DAW systems. You can use automated effects, record voice, import audio files, and multi track up to 10 tracks of audio. Check it out and I think you will be as surprised as I was how well it works considering the power of this FREE software. Click the connection to go to their site where they have a short tutorial introduction to the software. Pretty cool! Way to go Avery!